Alpina are made by Stiga Group / GGP - makers of Stiga, Castelgarden, Mountfield and Atco. We can deliver your new Alpina AT8102 HCB to anywhere in Ireland. We deliver ride on lawnmowers in our own van, this allows us to assemble and check each ride on lawnmower before delivery. 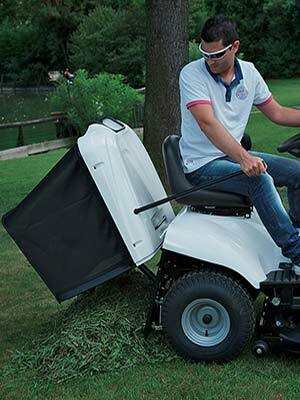 Our driver can also show you how to operate the mower when he gets to your house. The fact that we deliver ride on lawnmowers ourselves also means you have the option to pay the driver cash on delivery. We also provide a fully warranty back up to customers all over Ireland, no matter where you live. This means that any lawnmower bought from us will have our own back up service right to your door. Any problems give us a call. We have been selling Stiga Group / GGP mowers under all their brands and colours for almost 30 years. We like the Alpina range from Stiga due to their excellent build quality, premium features, great design and competitive pricing. 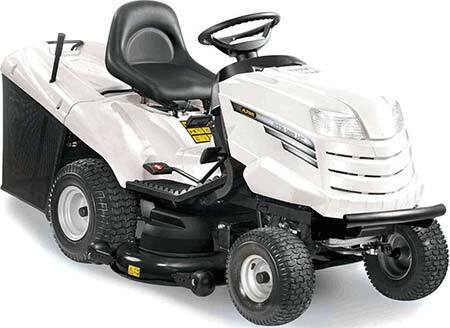 The Alpina AT8102 HCB is a premium ride on lawn mower for sale in Ireland. 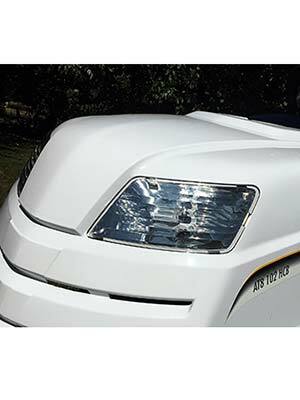 It is built on the tried and tested chassis for over 15 years. This model features a strong pressed steel 40 inch cutting deck and is powered by a powerful Briggs and Stratton 656cc V-Twin engine. 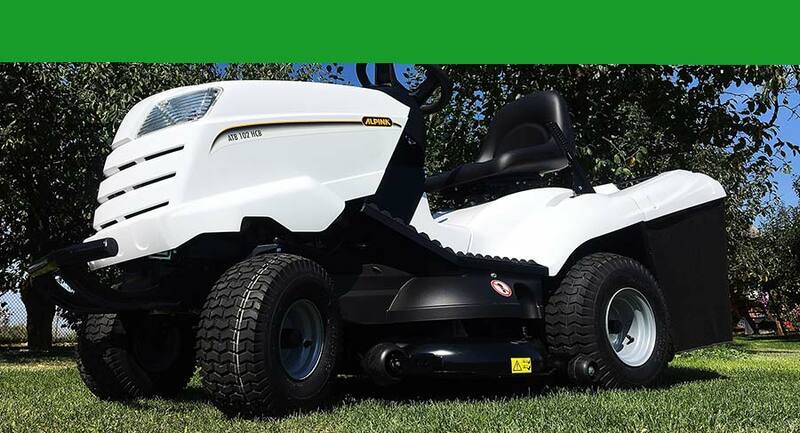 This mower is driven by a hydrostatic gearbox and comes fitted with a 300 litre grass collector which is fed by a direct collection chute for great grass collection and less blockages. The cutting deck is engaged via an electromagnetic blade engagement. Premium features on the Alpina AT8102HCB include a padded steering wheel, ergonomic high back seat, foot padding in the footwell, LED dashboad display, mow in reverse button, pedal operated hydrostatic, front headlights and a front bumper. 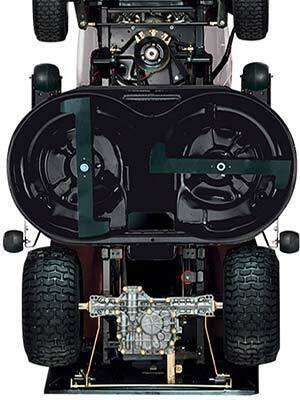 This model comes complete with a mulch plug, tow hitch and battery charger free of charge. At AM Rentals we can deliver your new ride on lawnmower fully assembled and ready to cut. We deliver brand new ride on lawnmowers all over Ireland in our own van, with our own driver. This means our driver can deliver your ride on mower fully oiled and ready for work. We can show you the features of your new mower and how to operate it safely in your lawn, our driver can also give a run through on the specific do's and don'ts of your new lawnmower to ensure years of happy cutting. Delivery charges apply and only cover fuel and toll costs to your door. We also provide a nationwide back up service to your door, no matter where in Ireland you live. This gives our customers all over the country great peace of mind that if a problem does arise we will be down to sort it out. We have been supplying new lawnmowers to customers all over Ireland for many years, during this time we have also provided warranty back up to your door, no matter where you live. This will not change going forward. After Brexit date in March 2019 we will continue to provide new ride on lawnmowers with excellent back up to your door, no matter where in Ireland you live.